The cardoon (Cynara cardunculus), also called the artichoke thistle, cardone, cardoni, carduni or cardi, is a thistle-like plant in the aster family Asteraceae. It is the naturally occurring form of the same species as the globe artichoke, and has many cultivated varieties. It is native to the western and central Mediterranean region, where it was domesticated in ancient times. 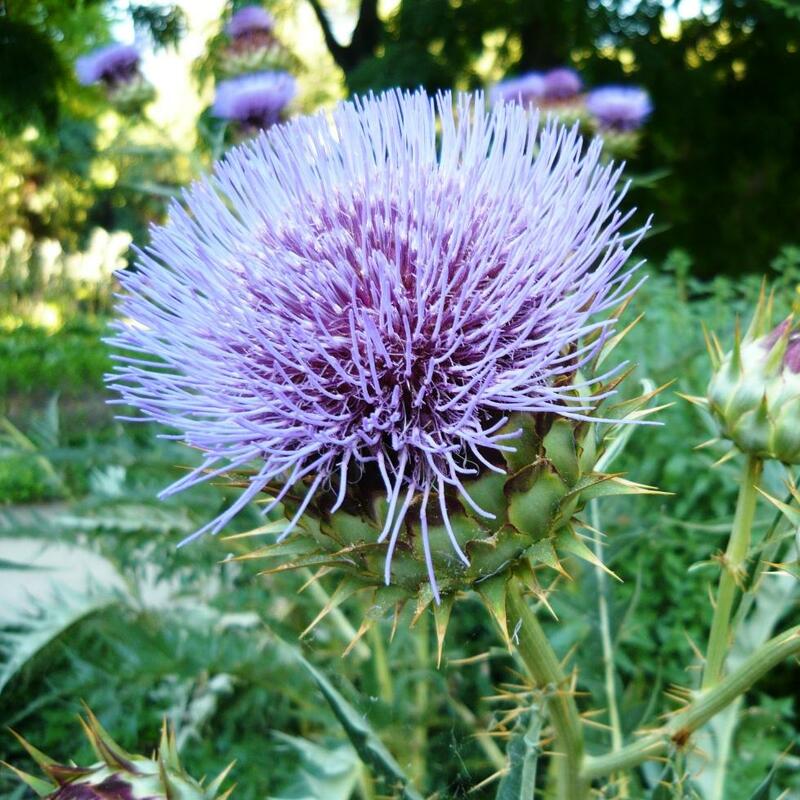 There are two main cultivar groups, the Cardoon (Cynara cardunculus Cardoon Group, (syn. C. cardunculus var. Altilis) selected for edible leaf stems, and the Artichoke (Cynara cardunculus Scolymus Group, previously distinguished as Cynara scolymus or C. cardunculus var. scolymus), selected for the edible flower buds. They differ from the wild plant in being larger (up to 2 m tall), much less spiny, and with thicker leaf stems and larger flowers; all characteristics selected by man for greater crop yield and easier harvest and processing. The cardoon was popular in Greek, Roman, and Persian cuisine, and remained popular in medieval and early modern Europe. It also became common in the vegetable gardens of colonial America. They fell from fashion only in the late 19th century, but the artichoke is still widely cultivated for culinary use, and the cardoon now more widely grown, at least in the UK as an ornamental. A wonderful plant for the back of the border. This variety grows to around 150-180cm tall, with silvery toothed leaves. One of the most notable things about this plant though is its striking purple flowers, like a giant thistle! These are almost an electric purple, and are incredibly attractive to insects, which is a definite plus! 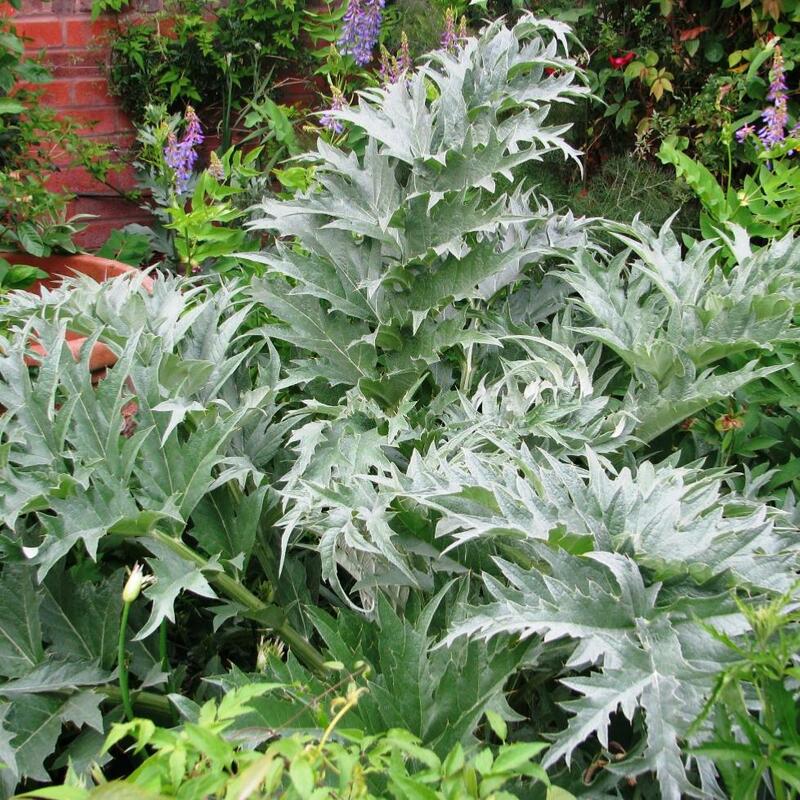 Cardoon will flourish in any well drained soil, especially chalky soils. Preferring a position in full sun - ideal for a hot, dry, south facing border. Shelter from strong winds. Soil, alkaline or neutral, loam, chalk or sand. Uses: If you are of a mind to do so, eat it, otherwise enjoy the dramatic foliage and plant as a specimen, or place at the very back of the border. Attractive to bees. Pruning \ Aftercare : Remove old foliage and flower stems in winter.